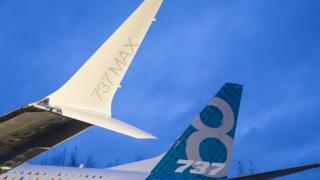 Two fatal accidents involving Boeing 737 Max jets have left the plane maker rushing to restore confidence in the safety of its fastest-selling fleet. As investigators work to determine the cause of the tragedies, the US regulator said the aircraft would be grounded until at least May. Boeing has halted 737 Max deliveries and some airlines say they will demand compensation. Some customers have signalled they could back away from orders. But analysts say the long-term impact on the firm will depend on the outcome of the investigation. Many countries grounded the plane after an Ethiopian Airlines 737 Max 8 flight crashed on Sunday minutes after take-off, killing 157 people on board. In October, 189 people were killed in a Lion Air crash involving the same model. Which airlines use the Boeing 737 Max 8? How important is the 737 fleet to Boeing? US regulators say the 737 Max, the fastest-selling plane in Boeing's history, is now likely to be grounded at least until May. The aircraft is a new model, a heavily re-engineered version of its workhorse 737. Deliveries to customers only began in 2017. Globally, about 370 are in operation but the plane maker has close to 5,000 on order. Each plane on order was priced at between $45-50m, Mr Aboulafia said, and Boeing has "taken deposits worth a small portion of many of the orders received". What will happen to 737 Max orders? Boeing has temporarily halted deliveries of the new aircraft, following the decision by the US Federal Aviation Administration and other regulators to prevent it from operating. It will continue to build the planes, however, and currently has no plans to slow production. Nevertheless, some customers have indicated they could scrap their orders. Garuda Indonesia has said it may cancel its order for 20 planes, while VietJet said its recent $25bn order depended on the outcome of the investigation. Kenya Airways is also reportedly considering a switch to rival manufacturer Airbus. Boeing jostles with the European giant to be the world's biggest plane manufacturer. Airbus's A320 Neo is the direct rival to Boeing's embattled 737 Max. But swapping from one manufacturer to the other is unlikely to be a simple process. Both companies have bulging order books, and according to Greg Waldron, Asia managing editor of Flight Global, that means any new orders could take years to fulfil: "You can't just switch to Airbus, because Airbus has a backlog that runs for years as well." Mr Waldron believes the size of Boeing's 737 Max order book means the jet is not just significant to the plane maker, but is "very important for the future of the industry as well". There are other reasons, too, why moving from one manufacturer to another may be impractical. "There's pilot training to consider as well," says Peter Morris, chief economist at the aviation consultancy Ascend. "You tend to have Boeing pilots and Airbus pilots." The instruments and control systems used by the two manufacturers are different, and pilots need to be certified to fly different aircraft, so it isn't as simple as getting out of one aircraft and starting to fly another. However, if the 737 Max remains grounded for an extended period, some customers may see their deliveries delayed. That could mean renegotiation of orders, which could well hit Boeing's earnings. What else have airlines said? Some carriers say they will demand compensation. Norwegian Air and Czech carrier Smartwings are among the airlines reportedly calling for Boeing to pay up. But Teal Group's Mr Aboulafia said Boeing will be able to absorb any compensation costs. He argues the "worst-case scenario" for damages would be in the range of "hundreds of millions of dollars". "Since the company earns many billions of dollars per year, that's not a major threat." What impact will all this have on airlines? Because there are relatively few 737 Max in service, and the grounding has not occurred during a peak period for the industry, the impact has so far been relatively muted. Some carriers have been able to reorganise their fleets to cover for the missing aircraft. Others have experienced some disruption. Norwegian, for example, says it has been combining services on its transatlantic routes, using a single larger Boeing 787 to replace two 737 Max. This has left some passengers facing bus journeys to their final destination, but has avoided cancellations. If the 737 Max remains grounded for an extended period, and deliveries of new aircraft remain suspended, things will become more complex. During busy periods, airlines do have the option of leasing planes from specialist companies. A typical "wet lease", in which a plane is provided "ready to use" with crew, maintenance and insurance provided currently costs $3000-3300 per hour for an older 737-800, according to Ascend. It is also possible to lease the aircraft on its own, for between $230,000-330,000 per month. Airlines which had been expecting new aircraft to join their fleets may have to keep planes scheduled for retirement in service for a bit longer, or bring spare aircraft out of storage. While this is unlikely to trigger any safety concerns, it will add to their costs. One of the main attractions of the 737 Max is that it is considerably more fuel efficient to operate than its predecessors. "Airlines may well face higher costs," says Peter Morris. "They will then have to choose whether to absorb those costs or pass them on to passengers. In the end, prices will probably have to rise." What has it cost Boeing so far? Shares have lost around 10% since the crash, wiping about $25bn off its market value. The longer-term impact will come down to the cause of the crash. A software fix may prove less costly and quicker to fix than a major design flaw, analysts say. Mr Aboulafia says if the second tragedy was caused by the same issues as the Lion Air disaster, it will require "aggressive implementation of a software patch" for systems along with crew training on possible system failures. "None of this would be terribly expensive or time consuming, probably a matter of a few months, perhaps less." But Boeing will still face challenges in rebuilding passenger confidence in the brand. Flight Global's Mr Waldron says the firm's reputation has already been hard-hit. "Having your top-selling brand crash twice in a very short period is obviously very bad for their reputation. The fact that it has spread so widely on social media... is difficult for them. "It should recover, but it depends on how it resolves." The 737 Max is not the first mainstream aircraft to be prevented from flying for safety reasons, although it only happens rarely. Boeing's own 787 was grounded in 2013 because of battery fires, for example. It was rapidly modified, returned to service and continues to notch up healthy orders. The McDonnell Douglas DC-10 had a poor safety record in its early days, and was suspended from operating in 1979 following an accident that killed 271 people. It remains the deadliest accident in US aviation history, but after a redesign it was allowed to resume flying - and remained in commercial service until 2014.